If I was buying some, I could at least say I was buying into a club that was giving something back, and providing some prestige value to the extension. That is all I want from an extension, something of value. Whether it works or not certainly isn’t just going to be on luck and availability alone. They want to build a brand for .Monster, and that is something you can invest in, not the word but what they are building. I would join the community even if i didn’t like the word. And if domainers shun it, great. I don’t need all the best names taken by people like me who buy and sell domains, then nothing easy to remember gets built. Leave it to pet projects, insider sites and “hidden eggs”. That is similar to where emoji domains are right now, but buyers are extremely happy. 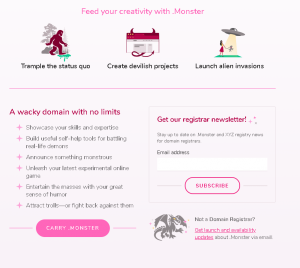 Domainers stay away if .monster is going to work for registrants. So its not 2 Million names, but the Domaining headline said it was? Too many domain gang stories on domaining for me these days. Ok so it was a joke, a prank. Still nice marketing. but Wait, this is real, i thought the whole thing was an April Fools Day joke, .monster. I”m in. I want to be a .monster. And you know what, I think I will buy a couple. The other thing that winked at me for .monster is it works with the dot. People forget that is wasn’t the com era, it wasn’t the com bubble or the com crash. It was the DOTcom era, the DOTCOM Crash and the .COM bubble. 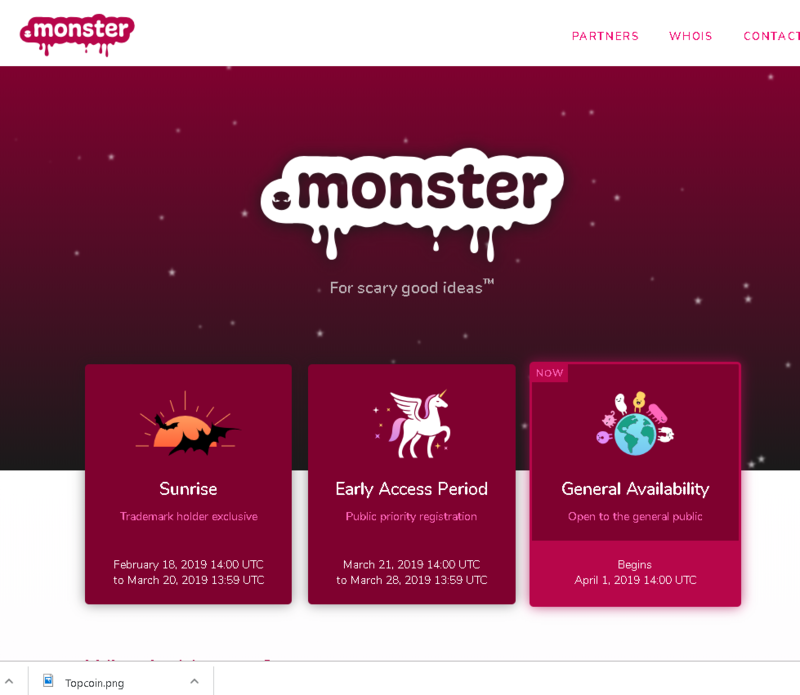 So I’m not just building on a monster domain names, I”m building on a DOT MONSTER, i want to BE A .MONSTER. Now you have to compare that to everything else you can invest in, everything is relative. But if i was trying to borrow prestige from an extension, I at least want to buy one that is investing in building its community, style, and place in the world. 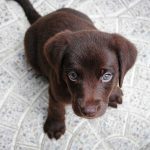 The little registrations at the start means better names will be available for real website builders and brands, not 200,000 short names and number taken in china. I think the natural use and growth of .monster may not show itself for about a year. Daniel, keep up the branding. New Tlds in 2002 or the new ones in 2014, just getting the systems to work between registrars and registries to meet the overwhelming demand has made all these new tlds profitable, based on the prospects. No one has “had” to focus on marketing. The way to make money for a registry is don’t spend anything. Look at Verisign, how many companies can be worth billions and have such a low percentage of revenue devoted to marketing. So whether its the stand alone new Tds like .club, or the global cctlds like the .LA I work with, there has to be a marketing component. For those looking for a bit more, here’s my story with new tlds. Until then, ill check back on .monster in six months. Comments below to put your predictions on record. I say 7-10,000 Names and 5-10 big brands using. This entry was posted in Domain Name Industry by page. Bookmark the permalink.